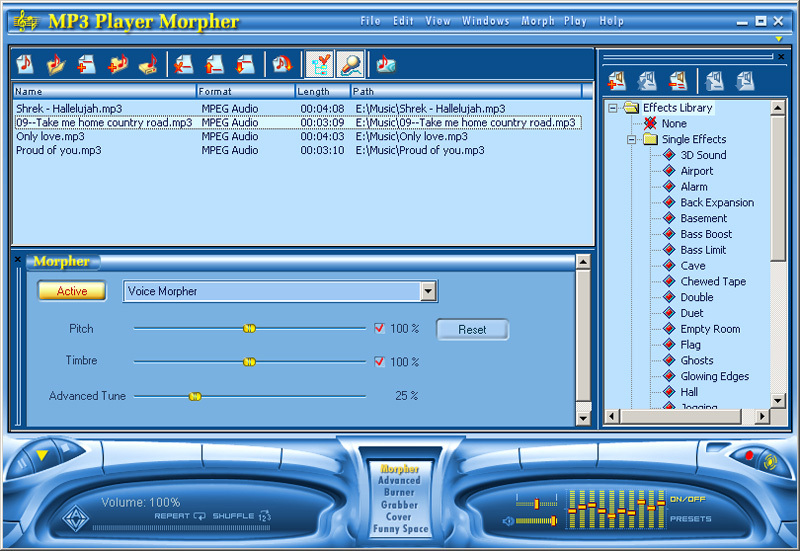 Morpher and Advanced Morpher are the most important tools to change voice of hot songs, add beats, bongo and drum loops, adjust the tempo or morph music with various special effects by 5 main and hot morphing equipments: Voice Morpher, Beat Tracking, Cher Modulation, Frequency Morpher and Tempo Morpher. Player and Recorder settings not only act as an audio player like Windows Media Player, RealOne Player, etc..., but also enable you to enjoy music in a new style. Player and Recorder allow you to listen to music as an audio player like Windows Media Player, Winamp, Jet-Audio... In particular, Recorder is used to record your original voice input from micro and save it as any kind of music formats like wav, mp3, wma, aif, ogg, etc. Then records can be morphed to another style with Morpher or Advanced Morpher. This function is useful in making a Karaoke album. Besides, Built-in visualization module supports visualization plug-ins of such programs as MS Media Player and WinAmp to help you relax when listening to music. CD Grabber can rip or grab audio files from a CD and saves them on your hard disk in multiple formats. CD Burner helps you burn audio files of mp3 and other formats directly to CD. In addition, CD Cover and Label Editor is a very useful feature for you to easily design your own CD covers and labels.